Paul Hicks designed the figures with peackless caps. Therefore my question . By the way, realy good paintwork. Lovely stuff - great scratch building. Okay. I am still a little handycaped by my toothache...so there was not much painting yesterday. Just managed to get it together and build a little flight stand. Here is the next batch of minis. Lovely! Who does the mounted Cossacks??? The link below holds the information as laid out by Father Primus. It is fairly vague. 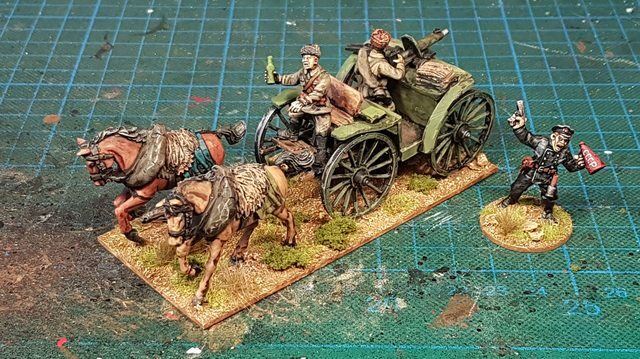 "Let's take some mongols/napoleonic french and turn 'em into any comissar's living nightmare - mounted cossacks!" 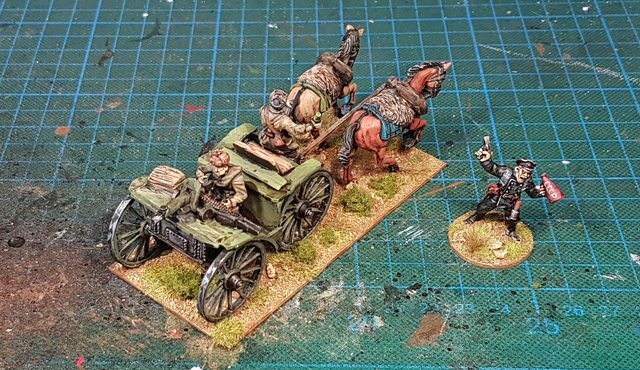 Mounted plastic Mongols are done by Fireforge Games. That tchanka is gorgeous. I am planning one also, but I think I'll make mine out of sheet brass. I think Don wrote plastic mongols, I suppose that means conversions from the Fireforge sprue. I would be very interested to read a step by step of that conversion process and compromises made regarding uniform. I sure as hell would like to do something similar and would appreciate Don's insight. Yes, as mentioned I used the Fireforge plastic mongols. Pretty much as they come out of the box. I just used mainly plastic french hussar heads from the perrys....cause they have cool moustaches. To get the distictive hats I scrapped the napoleonic headgear away (leaving just the face) and modelled the new cossak hats with greenstuff. Thats pretty it. The heads have little variation. 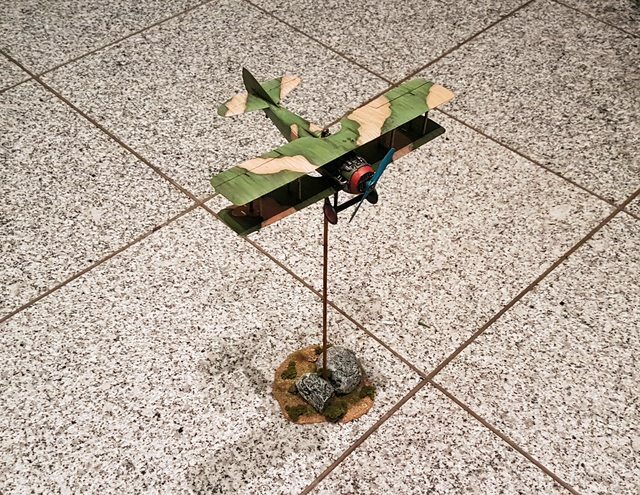 I used one plastic hussar with fell cap and one irokese head from the WW2 american airborne. In a later stage I added shoulderstraps but couldn't force myself to model the cool munition pockets on the chest, as father primus did. Still a little WIP, but I have some more troops to paint. So I will put on the side for now. Feel free to draw on the aircraft the badges of the imperial army - even the red ones flew for a long time with old identifying marks. Her is the tachanka with a little paint on it. To get some ...erm...paint in my white russian troops I painted a unit of Kornilov shock troops. I am not a keen black painter. Lovely stuff. 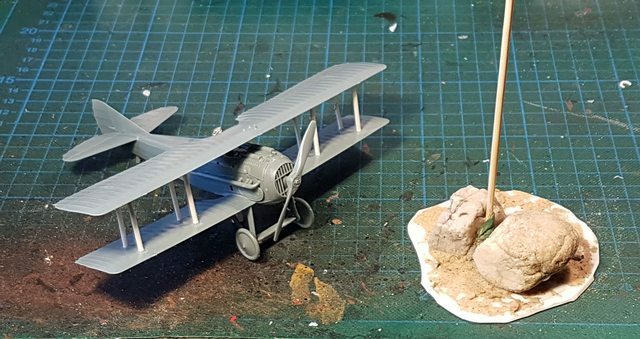 I agree the plane could benefit with a splash of colour and/or just the skull and crossbone on the rudder.